Corokia the generic name of this group of plants is an adaptation of the Maori name 'Korokio' They are a very useful set of plants for bonsai and I can not understand why you don't see more of them in displays. Corokia are very hardy even under extremes, they will survive in almost any soil and situation where other plants would definitaly fail. They have a very interesting branch structure and berry freely from an early age. Corokia thrive on regular trimming and respond well to shaping. There are two main varieties that most other hybrids are taken from. This is a very beautiful tree found in northland growing in association with Kauri trees. The leaves are a rich green with a silvery down on the underside. During November and December it has clusters of bright yellow flowers, these turn to dark red berries around August. This plant is used to cross with C. buddleoides to produce a hybrid called corokia x Vircata. 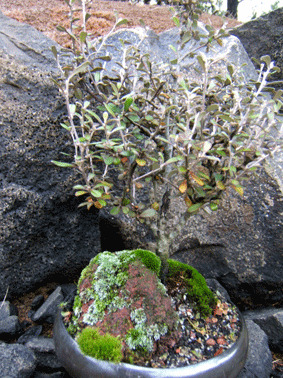 This produces a shrub with contorted stems and branches, usually covered with black bark. The leaves are smaller but similar in colour to Corokia buddleoides. They have a profusion of yellow starry flowers in spring and summer, followed by red or yellow berries in autumn. This is another great tree for the novice to hone their skills on. It loves being trimmed and shaped and has the added bonus of flowers and berries to provide a splash of colour in your collection. They will flower from a very young age and are very forgiving if a mistake with watering or care is made. Corokia will grow in any situation but they prefer full sun. This will also help them stay compact. Be careful with trimming it is easy to develop a poodle type style, which is lumps of foliage on the ends of each branch. This is ok if that’s what you are trying to achieve, but it is more like topiary than bonsai. These plants are troubled by very few pests again. The berries are favored by birds so some protection may be required in autumn. The only other damage that my Corokia have sustained is caused by the cicada. These insects lay their eggs on branches of trees, to do this they cut groves with triangular markings into the bark. You can find a lot of this damage towards the end of summer especially if you live in or near the bush. While this isn't fatal to the tree it weakens the branch and creates an unsightly scar. Quite often small branches will snap off in the next strong wind.